A few weeks ago I saw a tweet from a local hair salon that I had been admiring for months! 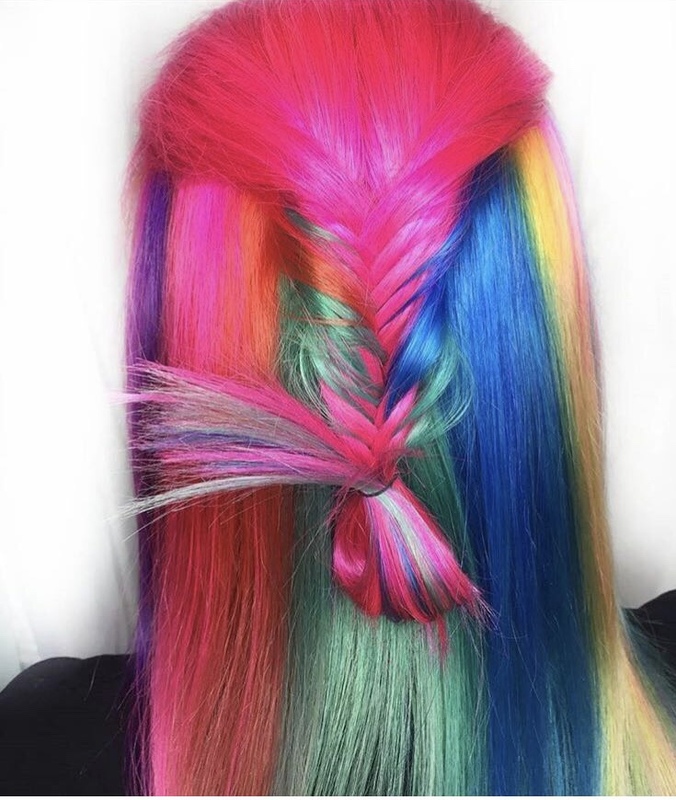 My daughter and I regularly would look up their social media, drool over gorgeous, colourful on point hair and dream of being turned into mermaids or unicorns ourselves. You name it we checked it out; their facebook, twitter, instagram feeds, you name it we were all over it. And then there it was a tweet asking if anyone was free and wanted to hair brightly coloured hair as a model. Well I jumped at the chance; a few messages back and forth with Ree the salon owner and boom it was all booked in. Rockalily Cuts is where it's at! 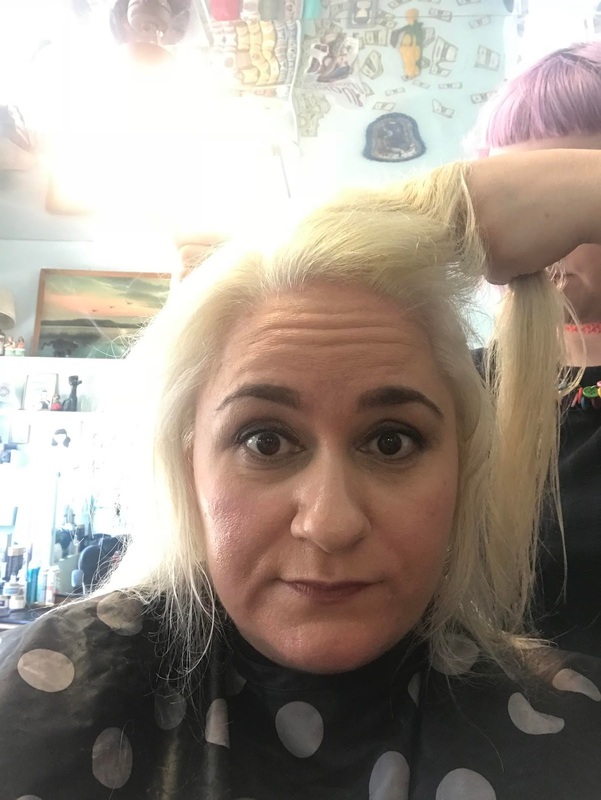 Before - rocking the Malfoy look! Essential to obtaining the desired bring look is a blank canvas. I've never been all over blonde like this before, suddenly my ageing greying eyebrows look so dark. During - Taylor sectioned my hair up and got busy painting. Here we have orange, blue, yellow, green, purple and pink all from the Directions brand. All in all I had a fabulous day at Rockalily, Taylor is a beaut of a human and I would totally recommend her and the salon to you all. If you are looking for something a little quirky, a bit vintage or something totally wild then head to Hoxton. The salon is a totally affirming, encouraging space. I left there feeling empowered and energised. On the route home an outstanding thing happened; I have lived in London for 15 months and no one has ever spoken to me on the tube till this day. On my way home 3 people commented on my hair! One moved down the carriage to say 'I love your hair', another at the station asked where my hairdresser was and the third woman simply clocked me on the stairs and said 'you look great today'. All three comments were from women. 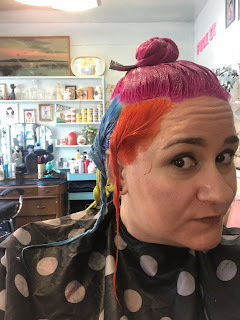 So there we go, a dream hair do by a fabulous hairdresser in an awesome hair salon. 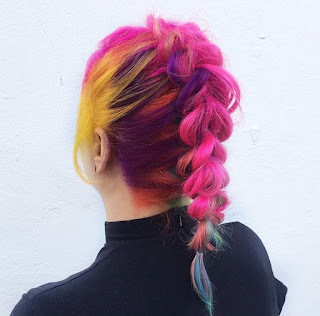 A total gift of rainbow hair and a gift of women encouraging women win/win!